Two Bedouins wandered the desert in search of something that didn’t exist. GM Sergey Shipov’s wonderful description of the second quarterfinal game between Vladimir Kramnik and Teimour Radjabov was almost enough to redeem what had become an unnecessarily long and lifeless encounter. Sergey Shipov’s original commentary in Russian can be found here at Crestbook, where you can also play through all the moves and analysis. Hello, dear viewers. This is Grandmaster Sergey Shipov commentating for you on the second round of the Candidates Matches Quarterfinals. Those who made a draw with Black yesterday gained a slight edge – they’ve still got the white pieces twice to their opponents’ once. And in order to take advantage of that you have to play aggressively! I hope today we’ll see some pressing by Kramnik, Topalov and Gelfand. As for Grischuk, I wouldn’t want to predict anything. Yesterday’s battle could have cost him a lot of energy… While today we’re going to watch the Kramnik – Radjabov game. There are two conclusions you might take from yesterday’s dull draw in this pairing. Either Teimour, following his old tradition, is deliberately playing for a draw in the classical games in the hope of beating his opponent in rapid chess (he’s used such a strategy successfully in knockout championships), or he’s simply not well enough prepared in the opening. In any case, it would be naive to hope that Vladimir will ‘give up’ a White so easily. He’ll try to take his chance, and therefore an interesting struggle should await us… let’s say, in the King’s Indian. For many years now Radjabov has been the main engine of progress in that most interesting of fighting openings – while many grandmasters have abandoned it, fleeing to the solid Slavs and other forms of the Queen’s Gambit Accepted. That makes it even more interesting to find out what Kramnik’s prepared in the key lines. We’ll see! 1. d4 d5 And there’s the response. Radjabov has declined a duel in the King’s Indian. He’s also emigrated – like all the rest. Bologan and Inarkiev will probably condemn him. But I understand Teimour. A principle’s a principle, but it’s more important to become the World Championship challenger. 2. c4 e6 3. Nf3 With this move order Kramnik shows an entirely predictable desire to play the Catalan Opening. 4. g3 Having thought a little and finding no ambush, Kramnik follows the normal path. 4…Nf6 And in fact things have come down to a banal move order transposition. 5. Bg2 0-0 6. 0-0 So then, on the board we have one of the main Catalan positions. 6…dxc4 The pawn that’s been neglected by the light-squared bishop had to die. Sooner or later. 7. Qa4 Another piece of pseudo-cunning. It seems as though there’s no difference which route the queen takes to c4 – via c2 or a4. 7…a6 8. Qxc4 b5 9. Qc2 Bb7 Thanks to the unloading of the centre Black has been able to post a counterweight to White’s fearsome Catalan bishop. The cost of that pleasure is the backward c7-pawn. An outline of the events to come – the struggle to play and prevent the c7-c5 push. 10. 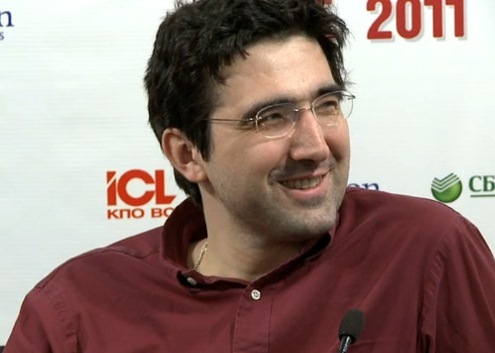 Bd2 Thanks to Kramnik’s successes in his games this continuation has become the main line. The bishop is heading for a5… or only giving that impression. A known waiting manoeuvre. 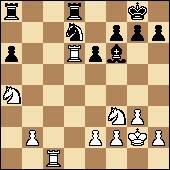 Black waits for the Bd2-a5 thrust, in order to meet it with the cavalry blow Nb8-c6. 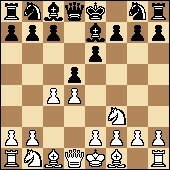 12…Nd5 Such is the bitter fate of White’s dark-squared bishop in this line – to die under the hooves of the black knights. Sometimes that happens on f6 (after Bc1-g5xf6), sometimes on f4. 13…Nxf4 Teimour decided not to get clever, and did what he’d planned. A logical novelty. Sometimes in such structures people take with the pawn, thereby increasing control over the centre, but in the given situation it’s more important to get the queen off the first rank, where it’s only getting in the way of the rooks. 14…Bd6 The most natural rearrangement. The bishop frees the square for the queen – and by their mutual efforts they’re preparing the programmatic c7-c5 break. 15. Qh4 A creative approach… which coincides, by pure coincidence, with the computer’s opinion. 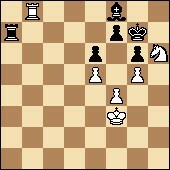 White offers to enter an endgame in which Black will probably be left with certain difficulties. 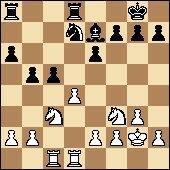 After all, for now the pawn remains backward on c7. 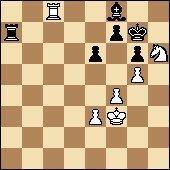 15…Qxh4 Radjabov agreed to his opponent’s offer amazingly quickly. 17…Nd7 Correct. There’s no point rushing. Black is within his rights to leave the pawn on c7 under the protection of the bishop, in the meantime playing f7-f5 and Nd7-f6 himself. The external weaknesses of his position are offset by the fact that White isn’t able to exploit them. Let’s look at the clocks: 1:35 – 1:22. 18. Nc3 Yet another justified decision. There’s now no point in directing the rooks at the c7-pawn, while the knight on c3 will probably help to create pressure on the queenside (via a2-a4). The d5-point is also no trifle. 19. Rac1 The players in the current game are playing solid, restrained and extremely cautious chess… You can sense the responsibility that’s weighing on them like a hundred-ton weight. Therefore they’re choosing moves with solidity in reserve. Topalov and Kamsky, on the other hand, are playing differently – bold and uninhibited chess. Shooting from the hip, like in the Wild West! Their game is distracting me more and more from the main one… But never mind. Evening will fall and when recording my video I’ll tell you all I think you need to know about the cowboys. There’s a time for everything. 19…Be7 Teimour is keeping to the main canon of the Catalan. He’s intending, without excessive creativity, to carry out c7-c5, simplifying play and gaining a draw. That’s his right. 20. Nf3 Again, dry and solid. And there it is, the result of White’s delay. Black has managed to prepare and carry out the freeing break in the centre. All that’s left is to calculate the consequences of the 23. d5 push. 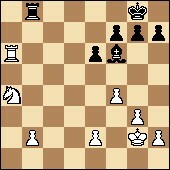 21. a4 Now, more likely than not, this break will only lead to quick simplifications and a draw. 21…bxa4 The simplest move. The fewer pawns, the fewer problems. 22. Nxa4 After long doubts Kramnik made the move that any blitz player would have played in a second. 24…Ne5! Ah, that’s it. Radjabov will organise new exchanges in the very near future. The burning sands of the Sahara are destroying all life on the chessboard. 25. Rxd8+ Rxd8 On account of the back-rank weakness White manages to remove the a6-pawn, but he can’t then hold onto his own on b2. A drawn outcome is close. 26. Nxe5 Bxe5 27. f4 Gaining space changes nothing. 27…Bf6 The players have plenty of time: 0:39 – 0:46. But almost nothing to think about. 29…g6 The last child’s trap has been avoided. 49. Kg4 Ra7 50. Kh4 The Gelfand – Mamedyarov encounter has also ended. In my opinion, the Israeli grandmaster had real chances of achieving success, but let them slip. While our sorrow continues… It seems it’s my fate to commentate live on the longest game of each round. But they vary. They vary a lot! The game consisted of two parts. In the first there was a sandstorm – a continuous series of exchanges that led to complete equality. In the second, two Bedouins wandered the desert in search of something that didn’t exist. Final impressions – thirst and sand on your teeth… Thank you for your attention and patience, dear spectators. Working for you has been Grandmaster Sergey Shipov. Until we meet again! Topalov – Kamsky: Sergey Shipov descriped this as an “epic” game. Despite the end result he said “it can’t be ruled out that Topalov’s novelty (9. o-o-o) will seriously alter the evaluation of this line”. It was Kamsky’s 10…Bh6! 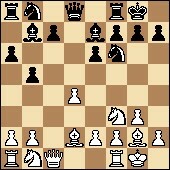 !, however, that he considered the move of the game, preventing White’s strategic plan of e4 and d5. The play that followed was very complex – looking at the “most natural” 13. Ng5 (from about 06:05) he notes that only computers are capable of navigating the complications. However, commentating on 15. Rd2? (the first move Shipov gives a full question mark) he says Topalov was let down by something else: “Topalov’s a colossal chess player, he’s very strong and energetic and so on, but he has inherent flaws. The main one, perhaps, and how he differs from Kramnik (here Shipov actually said, “and Topalov”! ), is that he has an insufficient feeling for the interaction of the pieces.” Shipov says that after 15. 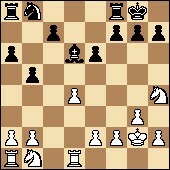 Be2, joining the rooks, White was risking nothing and what happened in the game wouldn’t have taken place. Shipov repeats this after 18. Rh4? !, saying again that Topalov didn’t sense the harmony of the pieces sufficiently. After 18…Kf7! Shipov says the rest of the game was just about converting the advantage, which Kamsky did brilliantly. Grischuk – Aronian: Sergey thought neither player was really ready for a battle after their long game the day before. The highlight of Shipov’s commentary on the game probably came from about 15:15 onwards. He says that commentators usually represent themselves as if they’re very clever and see everything, but that when he looked at this position during the game he just couldn’t work out why Aronian couldn’t play 13…Ne4. It turns out it was because of a queen sacrifice – Shipov draws some consolation from the fact that a 2478-rated player had made that mistake in an actual game. He identifies the key moment in the encounter as move 15 (about 16:30 on the video). After Aronian’s dubious opening had given White an edge it seems he let it slip here for the opposite reason to Topalov: “He was let down by his classical education”. He decided he had to castle, while 15. Qa4 would have maintained an edge. That wasn’t the end, as Shipov still says that White had options on move 17, where Black’s position isn’t as easy to defend as the computer claims. Gelfand – Mamedyarov: One curiosity here is that at about 24:20 Shipov says that he’s “simply obliged, as a commentator, an upright man and a citizen to show an amazing line that popped up in analysis”. Again, it involves a queen sacrifice. The key moment in the game, according to Shipov, was on move 33. He was sure that Gelfand was going to win, and he could have “ensured a large edge with the banal move 33. Qb3”. After 33…f4! it already seems to be too late. Shipov says that 34. Nd2 is incorrectly evaluated by the computer, and that Black has enough compensation in all lines. 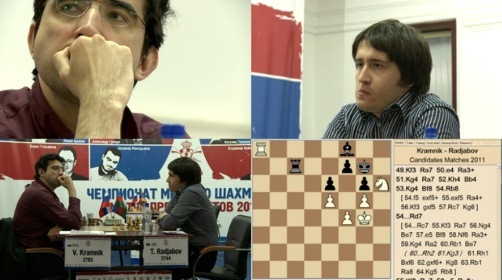 Kramnik – Radjabov: There isn’t, of course, a lot to add about this game, but Shipov decides to give 1…d5 an exclamation mark, noting that Kramnik would have prepared 15 strong novelties in the King’s Indian – actually he says “Boris Vladimovich”, instead of the correct “Vladimir Borisovich”, which explains the laughter at the start! The next, non-chess, interest comes in the discussion of 15. 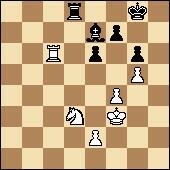 Rd1, which had only been played once before by a Norwegian chess player, Johannessen. At about 30:20 Shipov shows a photo of him with an unidentified woman, leaving it as homework to work out who it is… I’ll save you the effort by pointing out that it’s Shipov’s daughter, and the photo comes from the wonderful report that Shipov (and his daughter!) produced for ChessPro on the tournament he won in Norway above Magnus Carlsen (I translated some of it for my article: The Kid Carlsen). 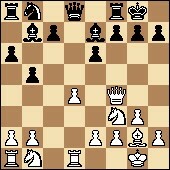 A final Norwegian theme is that at about 32:00 Shipov shows how Black could have advanced his pawns. “I’ve got no doubt that Carlsen, in a fighting spirit, would simply have played this position for a win as Black.” When Kramnik started to play for a win in an almost dead-drawn endgame Shipov said it was “an imitation of fighting spirit”, and a Candidate Master, or even a Class A player, would have held as Black. Overall he feels that Radjabov and Kramnik are both at least subconsciously happy for the match to go to rapid chess. I’ll again be translating Sergey Shipov’s commentary on Game 3 today. It’s Kamsky – Topalov, where we’ll be able to see if Kamsky can be the first to qualify for the semi-finals!